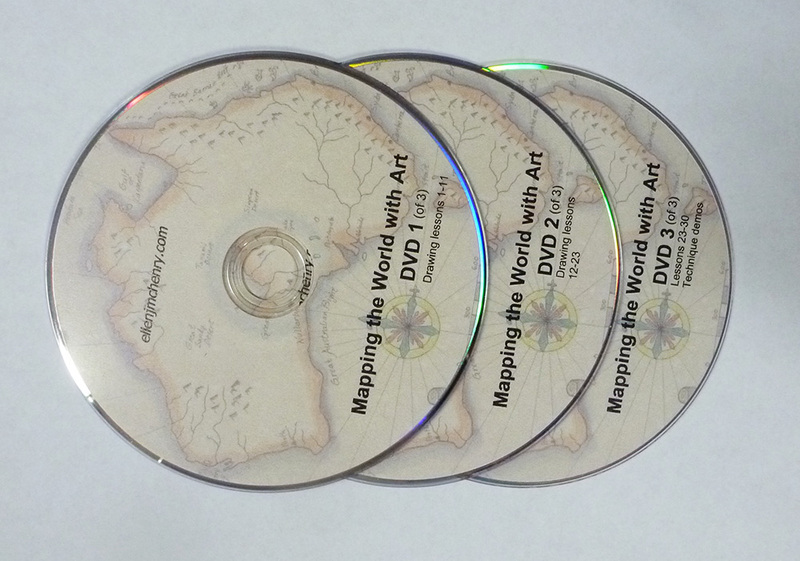 This version of the curriculum comes to you as one CD and three DVDs. The CD contains the PDF file for the entire booklet. You can read it off the screen and just print out necessary pages, or you can have the whole booklet printed on your computer printer or at an office supply store or professional printer. (The content of this CD version is identical to the hard copy option.) The DVDs you receive are described below. 1) Part 1 contains 30 short history lessons. Each lesson is one double-sided page. The writing is straightforward and easy to understand and is accessible to younger students, but it does not have a patronizing “written for kids” tone, and thus is appropriate reading for older students as well. The drawing lessons and activities are based on the themes of the history lessons. The lessons start with the beginnings of cartography in ancient Greece, and end with the official discovery of Antarctica in the 1800s. 2) Part 2 contains the drawing lessons. Each drawing lesson has step-by-step pictures that guide the student as they draw an area of the world from scratch (starting with nothing but a blank piece of paper). This method of learning is absolutely ideal for kinetic learners, but I have found it extremely effective for all types of learners. (I found it so effective that after writing “Mapping the World” I now use at least one “draw-from-scratch” activity in every subject I teach.) The drawing lessons progress in such a way that later drawings incorporate earlier ones. For example, in one of the first lessons you learn to draw the Nile River. Later, when you draw Africa, you already know how to draw the Nile. The drawing lessons tend to stay away from political boundaries, although some could not be avoided (France and Spain, for example). 3) Part 3 contains extra activities and worksheets that go with the history lessons and/or the drawing lessons. Activities include extra worksheets for practicing what was learned in the drawing lessons, group games, board games, crafts such as making simple navigational instruments, or art projects (about maps) using paint, crayons or colored pencils. There are also many supplemental videos suggested, all of which can be accessed for free via the Internet. The videos are mostly documentaries about the navigators who sailed around the world, or brief video visits to the places the students have drawn. SPECIAL ADDED FEATURE: As a supplement to the printed drawing lessons, I have recorded (in my basement workshop– I don’t have access to expensive video equipment) three DVDs that contain videos of each drawing lesson. If you or your student has trouble following step-by-step pictures (which I know are troublesome for some types of learners) you can watch the video of the lessons to get the general idea of how to do the drawing. PLEASE NOTE: I’ve found that some people regard these DVDs as the main part of this whole curriculum. I consider them to be just a supplement, not the focus. Please don’t rely on just the video demonstrations. Have the printed versions of the lessons near at hand so you can refer to them for sharper images of sketch lines and labels. Time needed to complete the curriculum: Personally, I would use this curriculum over the course of the entire year, using one chapter per week. I’d do the history lesson and drawing one day, and one or more of the activities on another day of that same week. However, you may use this curriculum however you want to. You may have a student who wants to zip through the drawings at a fast pace. That’s fine. Do whatever works for you. — Can I use this curriculum in conjunction with another? Yes, the history lessons are brief, so it would not be too much for your student(s) to read other history lessons alongside these. A book that dovetails particularly well is “Around the World in 100 Years” by Jean Fritz. — Can I just use bits and pieces of this curriculum without using the whole thing? You can use as much or as little of it as you want to. Just pick and choose what you want to use. Some people just choose the drawing lessons that are helpful at certain points in their own curriculum. — Can I use this with multiple age groups? Yes. In fact, this curriculum is ideal for using with mixed ages. I’ve heard back from customers who have used this curriculum with students as young as 7 or 8 (although I really don’t recommend it for kids this young) and as old as 18. — Can I use this curriculum with a group? Yes, it is great for using with a group. Even if you have no art skills at all, you can offer your group a geography drawing class. Just pop the DVDs into a DVD player and have the group watch the drawing lessons. This is especially helpful if your group has a very small budget and can’t require that each family purchase the curriculum themselves. — Can I get extra copies of the curriculum on CD to give to students in a group? Yes, just contact me about bulk discounts. — Can I get a replacement DVD if I lost one? Yes, just contact me by email. — Can I fit this in somehow with Classical Conversations Challenge A? Mapping the World through Art is BEST used as a precursor to Challenge A. It breaks down the process of drawing the world’s coastlines and makes it seem like a manageable task. I used this book the year before we did Challenge A and it was a big help. 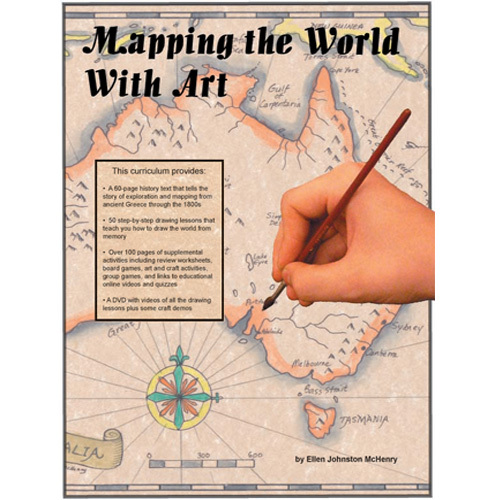 You will find that Mapping the World through Art will give you successful quick strategies for drawing Central America (particularly the islands, which are challenging) and South America. It will not help you much at all when drawing Canada and the US, since it does not address any geopolitical boundaries. No matter how you choose to do it, the important thing to remember for the purpose of Challenge A geography is that you must get to the blank sheet of paper quickly. Our best weapons for last year were repetitive tracing, and paper folding that broke the paper into chunks. My son did find that South America and Central America were very easy for him because of his prior knowledge of how to draw the shapes (as I mentioned we had done some of the lessons from Mapping the World through Art the previous year). Africa was also easier for him, I think, for the same reason.